You have a wealth of experience in both the military and meteorology. Which began first? They're sort of conjunctive. I joined the military in 1973 about two weeks before I graduated from high school. I always wanted to join the Navy. I got my draft notice about four weeks later. After boot camp, I spent several months at weather school because I always wanted to be involved in meteorology in some capacity, too. Not really. A lot of my career has been a series of springboards, going from one position to another. I can't really say I had a mapped-out plan because I always prefer to take life as it comes. Although working at the National Hurricane Center was a childhood dream of mine, I certainly never expected to end up working here. Because I grew up in Florida, born and raised in Miami. There were all of those storms in the '60s, and I had heard about the hurricane hunter planes. Information was somewhat sparse back then, so there was a certain aura or glamor associated with it. What was behind the decision to join the military? My father was in the Navy during World War II, and I heard his stories of being onboard the aircraft carrier USS Intrepid in Admiral Halsey's fleet. He was a machine gunner in some of those famous battles that we read about today. He also went through Halsey's Typhoon in 1944 that almost sunk his fleet. Hearing those stories piqued my interest in the military and weather, so I combined the two. Was there any interest in going to college at that time? My parents could not afford to send me to college, and a formal four-year education was not what I wanted to do anyway. Combining the military and meteorology was the best way to go for me at that time, and I have no complaints. My aspiration was to join the Navy, get involved in weather, become an enlisted chief petty officer, and then work my way up and become an officer. I wanted to go from Seaman to Admiral. I came close, but there is no Admiral rank in my particular field in the Reserves. My first tour of duty was overseas on the island of Crete. I came back to States and got out of the active Navy to get married. However, I stayed in the Naval Reserve and worked my way up through the ranks that way. What about the weather aspect? I went to various Navy weather schools to further my education and started with the National Weather Service in Tampa in 1978, first working with the observational group at the airport before being transferred to nearby WFO Tampa Bay/Ruskin to work the weather service group. It was a prototype office of what is now a Weather Forecast Office. I was able to learn the fruit/frost forecasting aspect, routine hydro met-tech stuff, launching balloons, taking radar observations, briefing pilots and issuing severe weather warnings. I transferred to Nashville, Tennessee and finished up my degree in physics and math from Middle Tennessee State University. I also took what few meteorology courses they had there, as well as some by correspondence. I eventually received a NOAA scholarship to work on my Masters degree at the University of Oklahoma. That is a tremendous opportunity. It was. I finished the bulk of my classes there, and then got on at the Oklahoma City forecast office for a year before transferring to the NWS office at the FAA Academy as an aviation meteorology instructor. I loved every minute of it! I probably learned more about meteorology in terms of theory and practical education by my interacting with some outstanding instructors there. You had to really understand meteorology if you were going to teach it. To stand up and be able to answer a question when someone pins you down and asks why something happens, you have to know the material. Oklahoma City was the site of the prototype Doppler radar. Were you involved? I transferred to the NEXRAD training office in 1992 and was an instructor there for teaching Doppler radar for seven years. I designed and developed some of the course curricula and training materials. 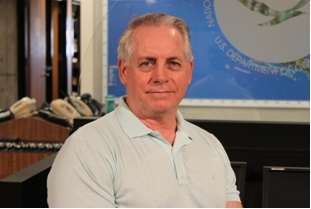 I came to the NHC and worked in the Tropical Analysis and Forecast Branch (TAFB) in 1999 and then transferred over to the hurricane specialist unit in 2000. Throughout all of this, you remained a Navy Reservist. That's right. I became a Reservist in 1977 after I completed my first four-year active duty hitch when I enlisted. I made Chief Petty Officer, and then was commissioned as an Officer in 1985. I am a Navy Captain now. I've performed various military duties all over the world. I worked at the Joint Typhoon Warning Center on Guam from 1986 to 2004, as a typhoon duty officer. That's the equivalent of a hurricane specialist here. It was a split tour, with the Navy sending me there to help out during the peak months of August and September. It was a great cost savings to the Navy. Yet your Reservist duty did not always involve meteorology. That's true. Most recently, I filled combat positions in both Iraq and Afghanistan. I spent 14 months in Iraq, most of that as an embedded training team commander. I was also in charge of a coalition base, and overseeing the largest military training base in Iraq. We also ran various missions out of that base, from routine supply convoys to going after unexploded weapons caches. Not wounded, but I was injured. I was conducting a dismounted patrol outside of my tactical vehicle/Humvee when I thought I saw movement in a drainage ditch. My foot was planted in the sand and, when I turned with all of the heavy body armor on me, I tore a posterior ligament in the knee and leg. It was heeling up fine, but in my last mission in March 2008 a roadside bomb went off about 5 meters to the right of my vehicle. It severely rocked the Humvee and lifted it off the ground, and I re-injured my left knee and leg again. The Army tried to fix me up in Baghdad because I had orders to go straight to Afghanistan after my Iraq tour. However, they weren't able to handle the injury, so I was sent Stateside to the Portsmouth Naval Hospital for two and half months for treatment. After that, I came back to NHC during the second half of the 2008 season. Three months later I had orders to go Afghanistan. I got there in January 2009 and worked as part of the International Security Assistance Force. I helped train NATO troops in counter improvised explosive devices (CIED) and counter insurgency (COIN) tactics. I also went on numerous combat missions across Afghanistan and especially in and around the capital of Kabul. It had to be an amazing experience. It was. I have no complaints, despite the injury. To see the improvements in Iraq, its GDP, its utilities, increasing freedoms, the overall quality of life. It's also improved in Afghanistan. Is it as good as Iraq? No, not right now, because we were fighting two wars and one had to stay in the background. Now that Iraq has stabilized, it is getting better in Afghanistan. You were recognized with the Bronze Star as you were leaving Afghanistan. Yes, and it surprised me. You never know what is going to justify the awarding of any particular military recognition. I didn't go over there to collect medals -- I went over there to serve my country, do what they asked of me, and help people who were unable to help themselves. You clearly enjoy your position as a hurricane specialist. What is the drive behind it? In life, to put it simply, I try to live my life by what the Bible say we should do --"Whatsoever you do, doeth unto the Lord. Do it with your whole heart". People can't take action based on our products if they don't know what we are talking about. So I try to put information in there I feel will help the general public, emergency managers, and technical people; information that will hopefully place confidence in the forecast. I try to approach every storm in the same way, whether it's small and weak or large and powerful. What's the greatest forecasting challenge that you experience? It's always been intensity forecasting, particularly rapid intensification. Hurricanes Charley in 2004 and Hurricane Wilma in 2005 are good examples. When it occurs over the open ocean, it's not as painful, so to speak, if you don't catch it. But our worst nightmare, as we saw with Hurricane Charley, is when it happens just a few hours from landfall. Right now, our ability to forecast rapid intensification is quite low, especially compared to our track forecast ability. What is the single technological item that could have most impact on hurricane forecasting? That would be remote data sensing. It just makes more sense to have a system that can remotely provide the same accurate information as a reconnaissance aircraft flight, especially considering the costs and hazards associated with those flights. With accurate space-borne remote sensing capability, we would be able collect more data and keep flight crews out of harm's way at the same time. I can also see more of the unmanned drone aircraft being used instead of the current fleet of aircraft that we use. However, satellite technology that would provide us with the kind of detailed information we currently receive from aircraft flights is still quite a way's off. I will be eligible to retire from my Navy career in about two and half years, and I might pursue that at that time. As for government retirement, we'll see how that goes. I enjoy what I'm doing and I don't foresee retiring from the NHC in the near future. However, the day will come when I will give it up and let the next generation 'run with the ball'. What I like to do that I don't get to do much of is fish. I do, however, spend as much time with my family as possible. I work in the yard, and I enjoy growing flowers and the beauty of nature. And I am also restoring two 1974 Pontiac Firebirds, which occupies a lot of my time.